On October 29, the Cardiovascular Institute at UC San Diego Health performed its 50th heart transplant of the year. 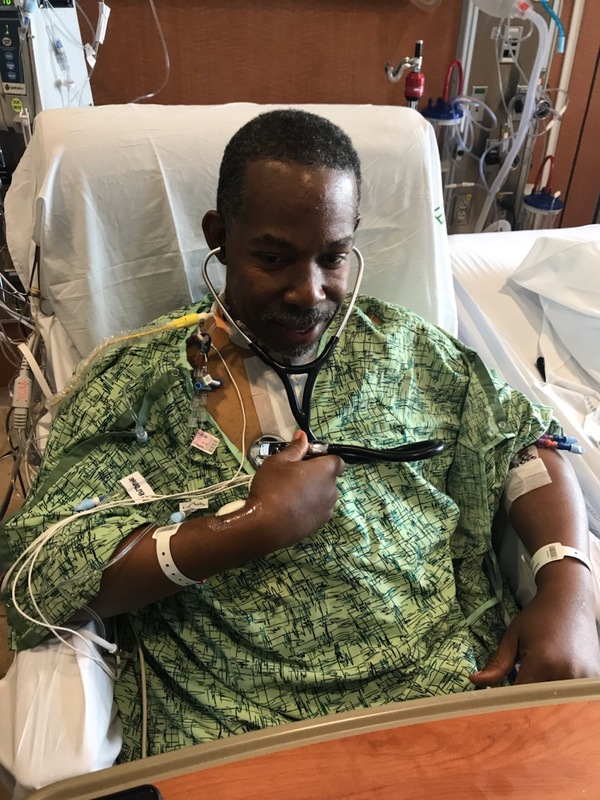 The patient, 52-year-old Nate Jackson, will spend Thanksgiving with family, friends and a new heart. "This is surreal. I am so appreciative for this life-changing opportunity," said the former high school football coach. "I’m ready to take on life as a new me." Nate Jackson listens to his new heart for the first time after becoming UC San Diego Health's 50th heart transplant patient this year. 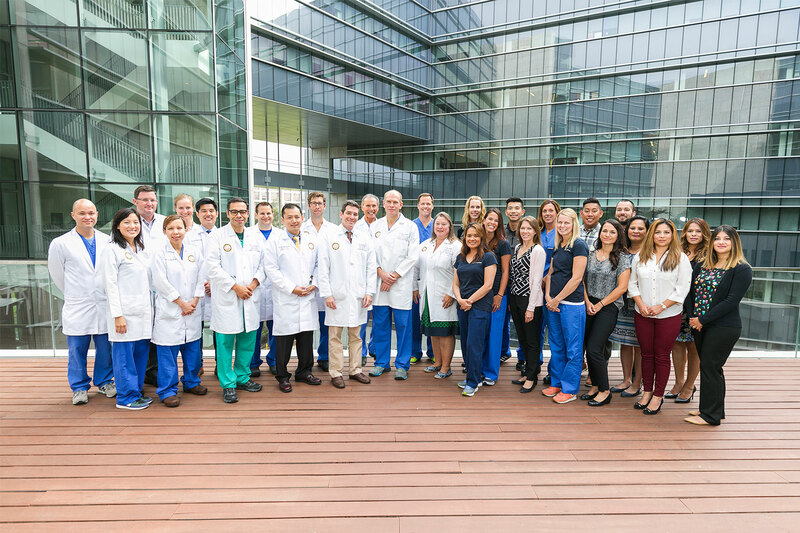 The heart transplant program at the Sulpizio Cardiovascular Center is now the largest in San Diego and the third largest in California, placing it among the nation’s top performing transplant centers. "Mr. Jackson walked more than a mile around the hospital floor just days after the heart transplant. We are so proud of him and this achievement," said Victor Pretorius, MBchB, surgical director of cardiac transplant and mechanical circulatory support at UC San Diego Health. "We want to thank Mr. Jackson for allowing us to treat him and express our deep gratitude to the donor who made this extraordinary gift of life." The mission of the transplant team is to help patients live life with purpose and to its fullest, said Eric Adler, MD, cardiologist and director of cardiac transplant and mechanical circulatory support. "When we see a patient like Mr. Jackson, we are reminded of how privileged we are to care for these inspiring patients." Adler noted that only a small number of heart centers worldwide perform 50 or more heart transplants annually. Over the past three years, the Institute’s heart transplant program has tripled in size while maintaining excellent outcomes. The heart transplant program at the Sulpizio Cardiovascular Center is now the largest in San Diego and the third largest in California. Cardiovascular Institute transplant patients have a one-year survival rate of 97 percent; the waitlist death rate is one of the lowest nationally, according to Adler. "The fact that we have a high volume and superb outcomes is testament to our commitment to providing lifesaving care that is safe and reliable. The institute is currently transplanting more hearts than any other hospital in San Diego. Local residents received more heart transplants in 2018 than in any year since the inception of the university’s program. This is due, in part, to the fact that locally donated hearts stay in San Diego. The institute also has a high organ acceptance rate, which allows the teams to transplant more patients overall. "Often patients who are turned down at other hospitals, get a second chance at UC San Diego Health. As an academic health system we have the resources, technologies, therapies, and experts only found inside a university," said Pretorius. According to Lifesharing, a regional nonprofit group that coordinates all organ donations in San Diego and Imperial counties, more than 3,800 people nationwide are on heart transplant waiting lists. In San Diego and Imperial Counties, 47 require a new heart. Of these 47, almost half have been waiting more than six months for a donated organ. As the region’s only academic health system, Sulpizio Cardiovascular Center at UC San Diego Health Cardiovascular Institute specializes in transplanting patients with the most challenging cases of heart disease. Its stellar reputation is built from its stellar faculty, peer-reviewed research, bridge-to-transplant technologies and clinical outcomes. Multidisciplinary teams transplant high-risk hearts, including those infected with curable hepatitis C virus. The institute also specializes in treating complex conditions, such as congenital heart disease, cardiogenic shock, chronic thromboembolic pulmonary hypertension and patients with left ventricle assist devices who need repeat surgeries. The institute's techniques and treatments are setting new standards in vascular, cardiac and transplant care to the benefit of all patients.